Since the city’s founding in 1630, Boston has tended to have a healthy self-regard for itself. The first governor of the Massachusetts Bay Colony, the Puritan leader John Winthrop, quoted scripture from the book of Matthew: “You are the light of the world. A city on a hill cannot be hidden.” Boston, of course, played a seminal role in the Revolutionary War, and a half-century later the city had acquired the moniker the “Athens of America” for its high-brow culture. In the decades leading to the Civil War, Boston was a hotbed of abolitionists. And long after it became clear that New York was the nation’s dominant city, Boston continued the facetious conceit, coined by Oliver Wendell Holmes, that Boston was the “Hub of the Universe.” Yet by the 1920s, the city was somewhat of a backwater, and it wasn’t until several decades later that Boston and Cambridge began to benefit from the very bright men and women who were educated at MIT, Harvard and other area colleges and universities. These days, the Boston area is a mecca for medical research and drug development, including neurological diseases, Alzheimer’s among them. Boston Globe reporter Robert Weisman, who specializes in health care and biotechnology, noted that Boston recently hosted more than 10,000 scientists and doctors in a convention devoted to neurological disorders. One is Cambridge-based Biogen, among the oldest and largest biotech companies. Weisman, the Globe reporter, quoted Paul Bolno, who previously worked for GlaxoSmithKlein. “The biotechs are moving the science forward.…There was a mass exodus of pharma companies like ours. The large companies are now on the sidelines trying to get back in.” Is it likely that Alzeon will receive significant backing? I would assume so. The closest we’ve come to something resembling a breakthrough was this past October, when clinical trials suggested, that Ely Lilly’s drug candidate was capable of slowing down the pace of Alzheimer’s. There was no expectation that Ely Lilly could stop Alzheimer’s in its tracks, but slowing down the disease would have been a singular accomplishment in itself. Should my cohorts and I accept the likelihood that our generation of people with early-onset Alzheimer’s will not be saved by some wonder drug? The odds of any of us who already are manifesting symptoms of the disease are not particularly encouraging, but we live in an era in which researchers are much more informed about the powers of the brain, and just being persistently optimistic may be a decent stratagem to maximize one’s years of cogency. I’ve never read Norman Vincent Peale, the author of The Power of Positive Thinking, but I often think of my dad, a relentlessly resilient soul, who, despite setbacks in his dual careers of commercial fisherman and schoolteacher, never seemed to get him down for long—not even on his death bed. His last, wan quip, just a day or so before he died: Not good news when the priest shows up! For me, this was a simple question. Within days after leaving my job at the end of July 2015, I secured free technical assistance to launch this blog. As I commented in that first post, “Writing has governed my life, in one way or another, since I started college. It helps me make sense of the world.” Unfortunately, most vocations are not so portable. The challenge is to impose structure on your days, weekdays in particular. I tend to do my writing in the morning, when my mind is most fresh. But if I am feeling pressure to meet my Friday morning deadline, as I was on Thursday, I’ll be in front of my MacBook for much of the day. More typically, I’ll stop tinkering with the piece I’ve been working on around 11:45, enough time to make the half-mile walk to my local YMCA, where I swim from 30 minutes to an hour. I make a point, before I leave my house, that I’ve packed everything I will need: swim shorts and cap; a pair of plastic shower sandals; a towel; my YMCA card with my picture on it; my house keys; and my cellphone. Unless I am planning to go to Market Basket to pick up a few items after I swim, my wallet stays at home. On the day of this year’s Super Bowl, I managed to leave my keys behind at the Y. They were recovered by the Y’s staff the next morning, but all through one of the most exciting Super Bowls, I kept thinking about where my keys might be, and how expensive it would be to replace the ignition key. For now, there are countless social and intellectual activities for people in the early stage of Alzheimer’s can engage in. Our support group functions somewhat like a social club. Engaging in conversation is good for the brain. And, to my delight, the Alzheimer’s Association has a relationship with the American Repertory Theater in Cambridge, enabling Paula and me to see at least three top-notch plays each year, with no cost to ourselves. And I’ve long been interested in languages. In 1983, I spent three months living with a German family, and seven years later I spent thirteen months teaching English in Hamburg. These days, my spoken German is extremely rusty, but if I encounter a German speaker, I am willing to exchange a few sentences. Recently, I’ve been doing some reading in German, and I’m also trying to acquaint myself with basic Spanish, a language that is well-represented in Somerville. My point is that new learning shouldn’t be just a diversion. It can generate new neural pathways, perhaps helping to slow Alzheimer’s progress. When I have been going on walks this spring, I’ve been keeping an eye on the flowers that I pass. Some, like daffodils, are known to almost everyone. What I search for are flowers that I can’t name. And there are many. 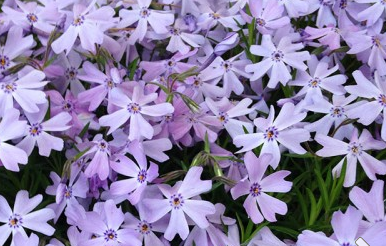 Until a few days ago, phlox was in that category. Now I seem to see these low-to-the-ground little plants everywhere, in various hues of purple and blue. And even in super-dense Somerville, with roughly 79,000 people in just four square miles, many wild plants are currently in bloom. The simple lesson is that if you don’t stay engaged in things you enjoy, and, even better—things that you haven’t tried before—you may be missing an opportunity for better brain health. Much has been said recently about “neuroplasticity”—the brain’s capacity to reorganize synaptic connections, especially after head trauma. I’ll write about neuroplasticity once I have a firmer grasp on this intriguing concept. The Australian writer Kate Swaffer appears to be one of a kind. Diagnosed with dementia before she turned fifty, she has done much more than just advocate for dementia funding or promote progressive policies that could help people who have been warehoused to reclaim a share of happiness. She has created, in Australia, at least, a sense that it is possible that the final years of dementia don’t have to be everyone’s nightmare. At the same time, she has been battling an assortment of symptoms, some of which are atypical. For example, since she was diagnosed with dementia, she has been diagnosed with acquired dyslexia. And she has remarked that the reason she blogs is not to build up a readership, or to educate people about this often misunderstood disease. It is to leave behind a digital version of her long-term memories, which she describes as fading. But despite her many difficulties, she continues to speak publicly, in Australia and abroad. Acknowledging that her mind needs help, she has nicknamed her husband her Back-up Brain, or BUB. In her book, What the Hell Happened to My Brain: Living Beyond Dementia, Swaffer presents a sometimes angry slant on how people regard the disease. This is not the first book-length treatment of dementia that I’ve read by someone with the disease. I learned much from my fellow Massachusetts writer Greg O’Brien, who wrote an insightful and sometimes entertaining book, On Pluto: Inside the Mind of Alzheimer’s. But Swaffer’s book goes one step further. It is a manifesto. Swaffer and I are of the same generation. We came of age in the early eighties, when the AIDS epidemic was in its early and most horrifying phase. A cure was many years into the future. I wasn’t very politically active during those years, but it appears that Swaffer was. Her activism is most notable when she is zeroing in on the elder care industry. In an inspired move, Swaffer coined the term “Prescribed Disengagement®, and then had the phrase registered. This is why the sentence you are reading includes the trademark symbol—®—near its end. Some readers skimming through the book may assume that Prescribed Disengagement® is a good thing. Doesn’t the ® confer legitimacy? Quite the contrary. Thanks to Swaffer’s book, I feel confident saying that the stigma of dementia is a good deal worse in Australia than it is in the United States. Many Australians, it seems, can’t get the stereotypes of dementia out of their heads. And for that reason, it takes more courage for Australians with dementia to come out of the closet. Swaffer reports that some relatives and acquaintances don’t believe she has anything wrong with her at all. As Swaffer puts it, “Others have openly suggested or accused me of lying for notoriety or sympathy.” One person with dementia Swaffer knows makes a point of carrying a letter from a neurologist, and another person keeps a brain-scan image at all times to demonstrate that the person really does have a serious disease. One of the strongest parts in this book is Swaffer’s critique of Australia’s nursing-home industry. In a chapter titled “The Language of Dementia,” Swaffer points out that only recently has it become permissible for people with dementia in Australia to play a part in the language that, in many cases, controls people’s lives. She bluntly states, “When people with dementia have reduced or impaired language abilities, then it is up to others to learn how to communicate with them, not the other way around. If challenging behaviours become part of the experience, then it is more likely due to not being able to express things like pain, poor-tasting food, or being bored, than it is the fault of the dementia.” Other tweaks in language, such as replacing “suffering from” to the neutral “diagnosed with,” can provide a more neutral (and accurate) description of the disease, Swaffer notes. One part of Swaffer’s agenda gave me pause: That people in nursing homes “wander”—essentially, escaping from their nursing homes because they are overmedicated and dreadfully bored. I don’t doubt that the previously sentence is correct. But while it’s all good to theorize about the state of mind of people far down the dementia path, it seems improbable that loved ones of the person with dementia would countenance anything that should put the person with dementia in harm. Even in temperate climates, wandering can be deadly. That said, there is much wisdom in Swaffer’s prescription. Don’t condescend to those who have the disease, no matter how “demented” the person is. Don’t underestimate their capabilities. And, most of all, don’t wantonly talk about the person who is present. He or she may be listening. The figure cited above—roughly 259,000,000,000 dollars—is the amount that is expected to be spent on Alzheimer’s disease this year. While this will continue to be good news for the care industry, it is bad news for Medicare and Medicaid. Last year, for every $100 spent on research funding on Alzheimer’s, $16,000 was siphoned off to care for people with the disease. This year, the proportion of people on Medicare with Alzheimer’s is roughly one in five. And projections suggest that by 2050, the proportion of people on Medicare will have doubled to 38 percent. These sobering numbers, presented at the national meeting of the Alzheimer’s Association on March 29, might have been cause for despair. But the mood was hopeful, in part because the disease is better understood than it has ever been. During last year’s contentious election cycle, the Alzheimer’s Association’s lobbying arm, the Alzheimer’s Impact Movement (AIM) highlighted two senators up for re-election—Roy Blunt of Missouri, a Republican, and Patty Murray, of Washington, a Democrat. Both were reelected. Behind their advocacy, the two senators managed to obtain a $350 million increase during fiscal 2016. And in the House, Democrat Nita Lowey of New York and Republican Tom Cole of Oklahoma led the effort. But funding was not the only objective. During the three days, several speakers described how Alzheimer’s had affected them personally. One of the most powerful messages came from Maria Shriver, the daughter of Eunice Kennedy and Sargent Shriver—an essential figure in the Kennedy and Johnson administrations. Shriver recalled her father as an “idealistic, intelligent, optimistic” man. He was deeply involved in the 1960s policy that came to be known as the “War on Poverty,” and, more broadly, one of the most ambitious social legislative agendas in American history. Yet by the time he was dying of Alzheimer’s in 2011 at 95, he could no longer recognize his loved ones. The statistics are overwhelming, perhaps numbingly so, and even more so for people of color. African-American women are twice as likely to develop Alzheimer’s as white women are. Latinas are at higher risk as well. And women of all ethnicities account for 65 percent of cases of the disease. As I was listening to Shriver’s testimony, it occurred to me that Alzheimer’s may be one of the rare issues in which partisan rancor in Congress does not dominate. Sure, there may be deficit hawks who have qualms about throwing money at such a huge problem, but few diseases disturb the public the way that Alzheimer’s does. I hope that Susan Collins, the moderate Senate Republican from Maine who chairs the Committee on Aging, can succeed in channeling funding in a manner that will, in fact, really make a difference.